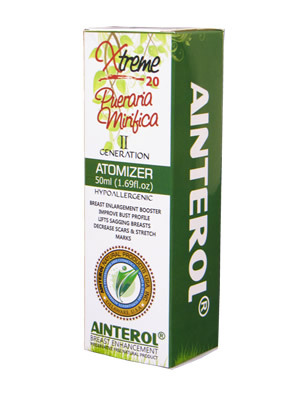 Contents: AINTEROL™ Pueraria Mirifica Breast Spray X-TREME20 (1.18fl.oz) 50ml - 20% Pueraria Mirifica Extract. Packaging: Spray bottle is shipped in EU retail sales packing (English). Shrink wrapped. English language with instructions how to use. Great way to boost breast volume. Designed to be used with our PURE500 capsules. 10% of Pueraria Mirifica extract with perfect aid from essential oil blend specially for breast caret. This increases blood flow around breast and brings all properties of Pueraria Mirifica Extract to mammary tissue. Pueraria Mirifica is a real "multifunctional" plant which works perfectly when used correctly. Just let it absorb and give your body time to adapt to it. Do not fear of changes what you are going thru during your treatment. It's a life changing experience. You'll literally shine after your treatment. Body feels young, energetic and looks better. Some don't even need any lotion during full PM treatment. Skin is full of nutrients and feels smooth & elastic. Increase efficiency with Pueraria Mirifica capsules. This way your treatment works like "double action". Capsules or PM powder effects from inside-out and Spray or Cream effects outside-in. Effects can be felt and seen faster this way. If you are using Pueraria Mirifica only for HRT. You don't need Breast Creams or Sprays. Check our SuperStore for capsule sets. Breast Spray is purely to breast enlargement treatment. Breast Cream gives you an additional breast & skin care with well selected cold pressed oils. You can use both at same time too. We recommend Spray for daytime use and Cream for nighttime use. Apply only to clean skin. What is the main difference between Spray and Cream ? Spray is ONLY for breast enlargement treatment. Cream in known to decrease scars. Both are very strong topical applications for breast enlargement treatment. Cream is multifunctional in which spray effects only as a growth booster. Sagging breasts without volume and lots of scars. Which one is best for me ? If scars are the main issue. We'll recommend to use Breast Cream with capsules. If your are totally flat chested and you have sagging breasts - highly recommended to start with X-TREME + capsule combination.